WhiteSmoke : Will It Enhance Your Writing Skills? The name WhiteSmoke was intriguing enough for me to stop and look for what it could be. 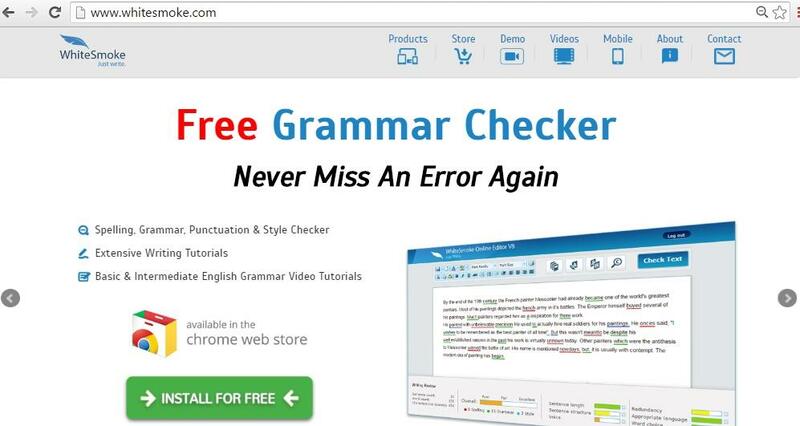 I wasn't really expecting it to be another writing enhancement software which would check for your grammatical mistakes and teach you better English. The information wasn't much, so there wasn't many other options left other than using it myself. The software is all about checking your grammar, correcting the spelling mistakes and syntax while suggesting you better options on how to put your idea across with a better choice of words and sentence formation. Certainly in a nutshell it is all the efforts put together to teach you how to write better English. WhiteSmoke says it would detect the common grammatical errors, including spelling and syntax through a system of contextual analysis of the paragraphs that you write, instead of going for a word-to-word corrective methodology which doesn't make much sense. The focus of the software is to elevate the level of writing of any learner and increase their command of the English language. WhiteSmoke is released by WhiteSmoke Inc., from Wilmington, Delaware, USA who are offering products for language development skills for different segment of people including students, business professionals, writers and so on. The application comes with a plagiarism checker tool as well that checks out the originality of a document and let you know from where texts have been imported if there is any case of duplicity. 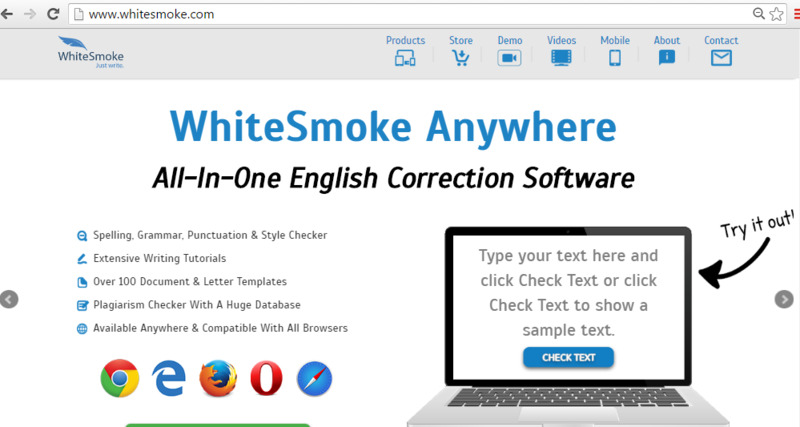 WhiteSmoke checks for all the grammatical errors including the spelling mistakes, typo, punctuation and syntax error and so on. Simultaneously it keeps showing the right word, sentence and the right grammar for the said text. Many times the writing might go wrong with the wrong choice of words with inconsistent usage of tenses breaking the general rules of the language that affects the writing style. WhiteSmoke takes care of that and makes you aware whenever such kind of mistakes take place. WhiteSmoke is a software developed with SMT (Statistical Machine Translation ) technology for the accurate translations in multiple languages. It even has an option of dictionary and thesaurus to manually check out the right usage of the translated text. Whitesmoke comes handy to webmasters, Editors and Publication Units as it serves you with the Plagiarism checking facility through which you can verify the originality of any write-up. After the completion of the grammar checking, the application goes to the next phase of generating a review report, that comes with an overall rating of the writing. It rates the write up in six separate categories that count the sentence structure, sentence length, redundancy, usage of voice, tense, informal expressions and meaning intended by the choice of words. For better reference, WhiteSmoke is geared up with the latest dictionary and thesaurus, along with the translator tool through which you can translate your writing into 11 languages. Apart from its accurate computer-based translator tool, the software also gives you an option named Human Translation that would connect you with their OneHourTranslation page where they offer an online translation service that has translation charges of seven cents per word. A huge number of templates are there in the app for extending support on writing the different types of documents based on their usage like templates of resumes, cover letters, business letters, personal greetings and so on. There are different ways to contact the customer support service in WhiteSmoke. It provides every alternative like telephone, email and online chat. The staff are doing their service well as they responded to the calls, emails within 24 hours. Moreover, the company website has the FAQ page where you get help topics covering almost every possibility of doubts and troubles. You also get an online user manual which you can access by clicking on the Help button on the user interface of the application. I would consider WhiteSmoke as an affordable software for grammar-checking, where you have the option to buy it with a lifetime license. The software also checks Plagiarism so it is even useful for the Webmasters, Editors, Publication houses apart from the writers. It checks for mistakes with accuracy and suggests better alternatives, which play an instrumental role in teaching good English to the learners without the embarrassment factor. The translation tool is an added advantage to this software that includes 11 language to which your text can be translated. The dictionary and thesaurus are good reference tools that not only help you in translation but also in writing. The price is quite affordable in comparison to its competitors. There are two different versions of WhiteSmoke: Writer and Anywhere. The Anywhere plan is not integrated with the Microsoft Office software. So if you are preparing a document in MS Word, you cannot use this software connecting to your document and to use it you need to paste the document in the application itself. We also noticed that WhiteSmoke does leave out some mistakes like the wrong usage of voices and cases of using double negative words. a quality writing enhancement software with an all inclusive set of features with an up-to-date dictionary and a translator tool. Though it is never recommendable that a write up be completely surrendered to this automatic process of editing and proofreading, it definitely does the first level of task for the editors. But what makes it more a good choice, is the way it teaches the English language to the learners. So the application has multiple utility for which they don't charge you exorbitantly and at the same time helps you in increasing the command over the language taking you to the next level. 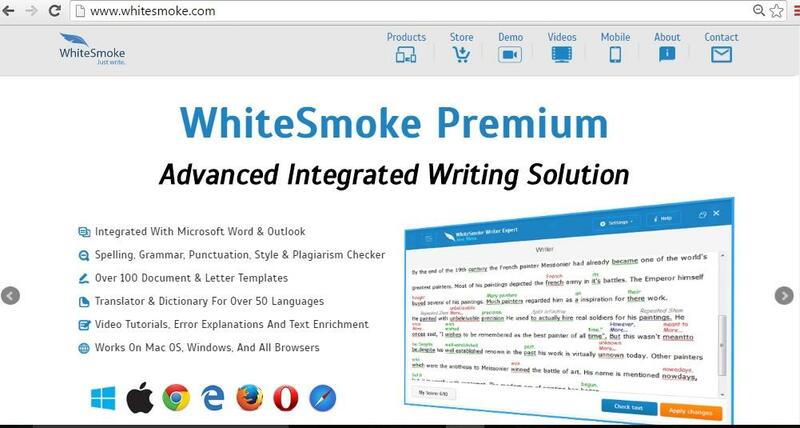 To sum up what sells WhiteSmoke is its simplicity in which a single keystroke can analyze any document and start the job of finding out errors with the correct suggestions of spelling, grammar, and syntax while offering writing tutorials with loads of templates to take you to the right track of knowledge where you come to know which style has to be used for which type of writing.